Cryptopay FAQ: how to buy bitcoins? what is crypto card? etc - What countries are part of SEPA? All Categories › Buy, deposit, withdraw ​>​ Bank deposits and withdrawals › What countries are part of SEPA? 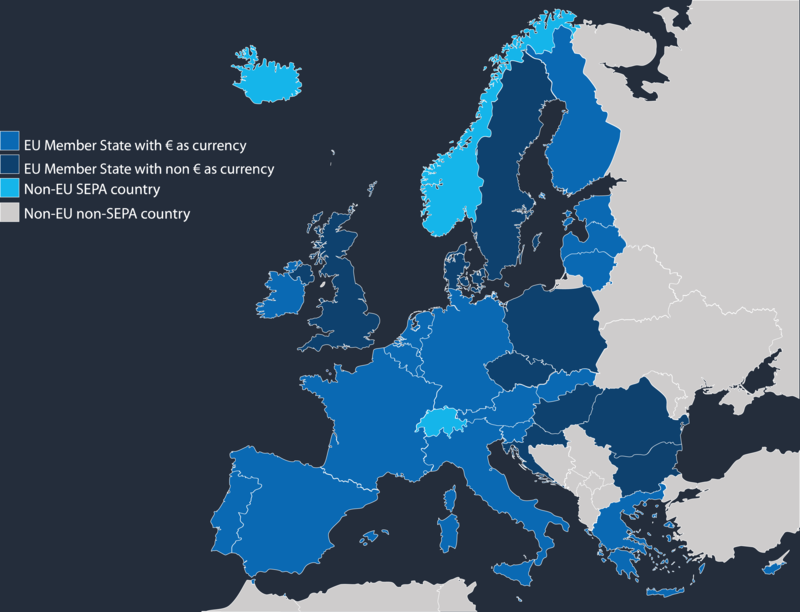 What countries are part of SEPA? Austria, Belgium, Cyprus, Estonia, Finland, France, Germany, Greece, Ireland, Italy, Latvia, Lithuania, Luxembourg, Malta, Netherlands, Portugal, Slovakia, Slovenia, Spain, Bulgaria, Croatia, the Czech Republic, Denmark, Hungary, Poland, Romania, Sweden, United Kingdom & Northern Ireland, Iceland, Liechtenstein, Norway, Monaco, San Marino, Switzerland. Cyprus: Northern Cyprus is excluded. Denmark: the Faroe Islands and Greenland are excluded. France: the French Southern and Antarctic Lands, French Polynesia, New Caledonia, and Wallis and Futuna are excluded. Nevertheless, the last three are part of SEPA COM Pacifique. Netherlands: Aruba, the Caribbean Netherlands, Curaçao, and Sint Maarten are excluded. Norway: Svalbard and Jan Mayen are excluded. Residents of what countries and territories can participate in the Cryptopay ICO? 2019 CPS Transfers Ltd (Firm Reference Number: 776056) is a Small Payment Institution registered with the Financial Conduct Authority. CPS Transfers Ltd is registered in England with registered number 10311113 and principal office at 12 Hammersmith Grove, London W6 7AP, UK. In the EU, Your C.Pay Visa prepaid card is issued by Wirecard Card Solutions Ltd (WDCS) pursuant to license by Visa. WDCS is authorised by the Financial Conduct Authority to conduct electronic money service activities under the Electronic Money Regulations 2011 (Ref: 900051). CPS Transfers Ltd is the Card Program Manager. Cryptopay Ltd, trading as C.Pay, is the Card Co-Brand. Please note the Visa card is an electronic money product and although it is a product regulated by the Financial Conduct Authority, it is not covered by the Financial Services Compensation Scheme. We ensure that any funds received by you are held in a segregated account so that in the unlikely event that Wirecard Card Solutions Ltd becomes insolvent your funds will be protected against claims made by creditors. For the purpose of the Data Protection Act 2018 and GDPR, CPay is registered with ICO under the number ZA029520.